“You’re telling me that Ralph Kendrick, the bogeyman of my worst nightmares has escaped from jail?” Eyes wide and unbelieving, Fiona Morgan asked the detective standing at her front door. She reached for the door frame to steady her wobbly legs. When she was ten years old, Fiona Morgan and two Girl Scout friends stumbled across Ralph Kendrick murdering a young woman at a Minneapolis park. At his trial when he was convicted of Rose Wilson’s murder, Kendrick threatened to kill all three young girls if he ever got out. Now, twenty years later, Fiona discovers that Kendrick has indeed escaped from prison, and he may have wealthy connections. She hires a bodyguard, Ted Collier, veteran police officer to protect her. Matters get worse for Fiona when she finds out that Kendrick knows that she is an identical triplet. He has told other inmates he doesn’t know which one testified. So he’ll eliminate all of them. This means five women are at risk. Two days later, Tory Girard, one of Fiona’s Girl Scout friends, is found dead in Minneapolis. Tension builds as Fiona and Ted try to stay safe and track Kendrick down before he can kill or hire someone to kill again. 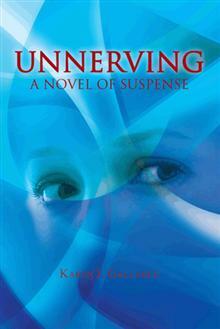 Karen J. Gallahue is a former occupational therapist who now satisfies her overactive imagination by writing stories of suspense. She lives in Naperville, Illinois,with her husband,Greg. Her previous book is Murder with a French Twist. There is also a rafflecopter giveaway opportunity in conjunction with this book blitz. You can find that HERE.